Today’s artists come of age in a thicket of appropriation, whether it’s the quotation of a famous artwork, like Marcel Duchamp’s drawing a mustache on a postcard of Mona Lisa, or pop music made from sampled, previous hit songs. So it came as no surprise when, in April of 2014, the familiar profile of a tobacco smoker’s pipe, underlined by a brief French text, appeared on the campus of UVU. The victim, Belgian Surrealist René Magritte, would not have been surprised to see yet another borrowing from his celebrated 1929 painting, “The Treachery of Images,” in which the line beneath the pipe translates “This is not a pipe.” At UVU, however, where the image identified the location of a temporary art exhibit, the line had been changed to mean “This is not an art gallery.” Behind it lay a small campus rebellion, politely done and with faculty supervision, as befits Utah rebels. The show’s goal, as faculty supervisor Courtney Davis explained, was to give students, who were usually restricted to studying conceptual art in their textbooks, a chance to make and install conceptual works of their own. The sharper point of the sign, though, as student Larry Revoir explained to the media, was to recall how UVU’s art department has to function without its own gallery. UVU does operate the Woodbury Art Museum, located two miles off campus in the University Mall, but the Woodbury doesn’t function as an art department gallery. Instead, students wishing to see their work displayed there must be juried into the Museum’s calendar of exhibits. That opportunity came soon enough for Revoir, who a month later saw his ceramic sculpture “Touch” accepted into the Woodbury’s Art of Our Century. 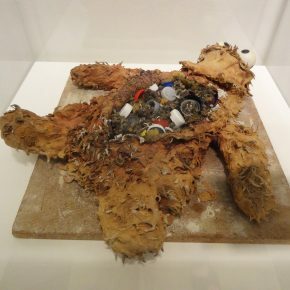 “Touch” displays a technique also favored by Salt Lake City artist Colour Maisch, in which the artist saturates a flammable object, in this case a fuzzy, stuffed toy animal otherwise impossible to copy accurately, with diluted clay, then fires it to burn out the textile original and solidify the reproduction. 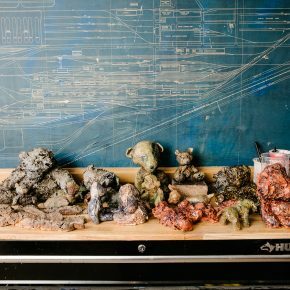 In 2012, when he’d crafted “Touch,” Revoir had been a student of UVU’s influential ceramics professor Brian Jensen. Two years later, when he appeared in Art of Our Century, he had found a purpose for this technique’s uncanny verisimilitude. 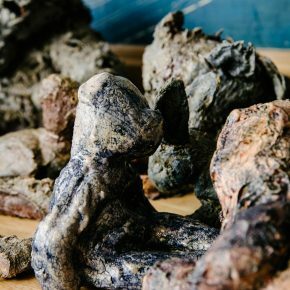 Shortly after Art of Our Century closed, the Woodbury hosted the punningly titled Inciteful Clay, a touring exhibition showcasing ceramic art’s capacity to grapple with controversial topics. In Utah, however, Inciteful Clay opened minus works that had shown elsewhere on its tour, but which addressed topics too “hot” for public discussion. Encouraged to replace those works with more palatable local artists, staff chose Revoir’s “Monster,” a sequel to “Touch,” which slipped under the censor’s radar when its searing excoriation of an assault on nature failed to trigger alarms calibrated to challenge sexual, rather than environmental content. “Monster” was like an aesthetic IED, able to charm viewers into lowering their guards, only to detonate later. What Revoir had found was a material metaphor for the damage done to living things by environmental degradation. Early, fragmentary visions of environmental threats focused on pollution as a problem conservation might cure, but it took an artist’s vision to comprehend how rapidly the natural world was actually disappearing, its absence concealed by replacement with industrial and cultural developments. Indeed, popular arts had made themselves an ironic part of the problem, by replacing the natural order with its image in paintings, photos, videos, sculpture, theme parks, and other ubiquitous substitutes. The tiny corpse Revoir labeled ”monster” provided a dose of truth that penetrated the illusion that somewhere else, all was well. Instead, he shows that elsewhere innocent offspring are swallowing colorful bits of industrial waste that have fooled their doting parents, which their bodies have no way to digest or dispose of, but which are revealed to be more durable than their victims after they starve to death and their decomposing bodies break open. Revoir has no interest in pointing fingers or assessing blame. Rather, what he rightly calls monstrous is the inversion of natural order whereby living creatures, following the instincts that kept them safe and thriving in their environmental niches, are fatally betrayed by their inability to evolve fast enough to meet the accelerating changes brought on by such developments as plastic materials, hydrocarbon emissions, and population pressures. “Monster” mixed metaphors, using a children’s TV character to tell a story about albatrosses. Driven by the urgency of the perceived emergency, Revoir moved closer to reality in July 16th, 1945: Enter the Anthropocene, which he exhibited in the Salt Lake City Library during October and November of last year. The title refers first to the date of Trinity, the first test explosion of a nuclear weapon, which preceded the bombings later that year of Hiroshima and Nagasaki, and second to the “Anthropocene Era,” a new geologic period proposed in 2000 by scientists Paul Crutzen and Eugene Stoermer. They argue that so many geologic circumstances have been profoundly altered by human activity that the Holocene Era, which followed the Pleistocene, or Ice Age, and saw the worldwide spread of humanity, has now ended and a new period of human dominance has begun. Revoir’s title posits the dawn of the nuclear age as the new era’s watershed year. 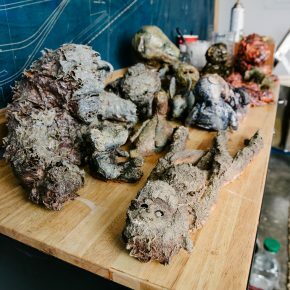 Anthropocene continued what began with “Touch” and “Monster,” connecting them to the work he will show at Finch Lane in January. 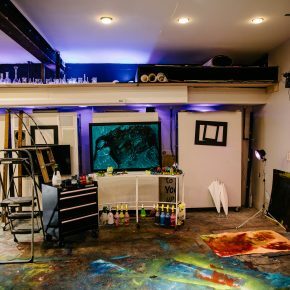 Currently, Revoir is hard at work in a complex of American Fork shop spaces that includes his own studio and that of Damon James, an Abstract Expressionist painter, which the two artists also share with sculptor Jordan Snow. There, surrounded by relics of the dismantled Geneva Steel works, they cooperate synergistically to minimize redundancy in their tools and equipment. 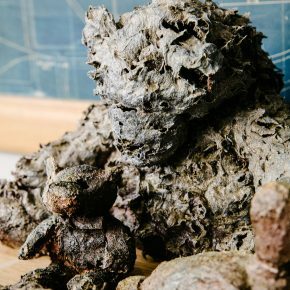 Here, Larry Revoir opens the lid of one of several kilns, revealing clay figures that recall the fulminant shock witnessed by those who first entered the boat houses of Herculaneum and the horizon-to-horizon devastation surrounding Mount St. Helens. 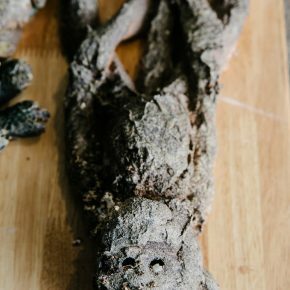 Revoir’s animal bodies are hollowed out, sightless, their colors chemically altered or burnt black. They sometimes bring to mind an old photographer’s lament: that the lush colors of Kodachrome made even pollution beautiful, frustrating an artist’s desire to capture and convey the true horror of the original. Indeed, these small ruins are often as beautiful as they are unbearable, their overall lifelike bearing and close-up grotesquery harking back to the Romantic notion of the sublime: to that which surpasses beauty to awaken feelings of terror and draw a witness toward the unknown. Subject matter alone cannot guarantee that the art it inspires will be good. That said, Larry Revoir has come further in four years than many artists achieve in a lifetime, and now captures a truth more vital than many artists ever achieve. He comes as close as an artist can to making it impossible to ignore how the living things now disappearing from our experience are not merely retreating beyond our sight, to parks and wilderness, but are dying out. 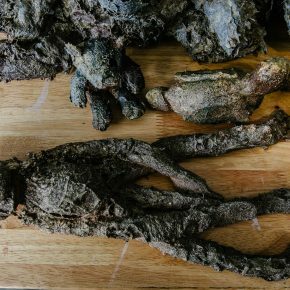 If the bodies piling up begin to seem redundant, we need to remember that each creature wants to be seen for itself, even as the victims of catastrophe would want to be individually recognized and remembered. Each unique demolition is like a name attentively carved on a black marble wall. No symbolic gesture, no conscience-assuaging donation, will save the natural world of which we, ultimately, remain a part. If death is the thing that gives life its poignant significance, then the death of a species gives dimension to all life. It’s not hard to argue that Larry Revoir has taken on the most important topic facing not only artists, but everyone today, when species are disappearing more quickly than at any time in millions of years. There is evidence enough to prove that the sixth Great Extinction is real, transcending science and trumping dogma. The evidence in the gallery, meanwhile, suggests that Larry Revoir will continue to seek new ways of giving visual form to the evolving holocaust, and continue to plangently convey truths we ignore at peril not only to our human dimensions, but to our very existence. 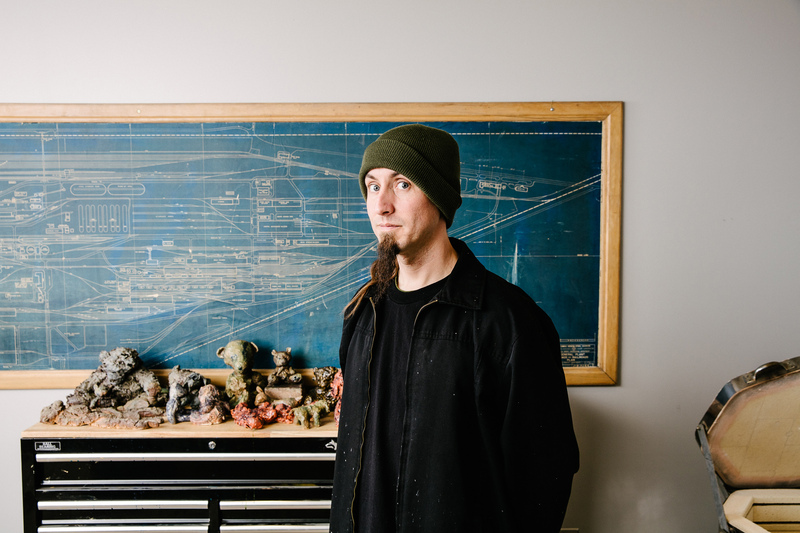 July 16, 1945: Enter the Anthropocene, ceramics by Larry Revoir, Finch Lane Gallery, Salt Lake City, Jan.15-Feb.26, opening reception Jan.15, 6-9 p.m. Gallery Talk by Revoir and Grant Fuhst, Jan. 23, 2-3 p.m.